Heads Up! Bang Out a Sweater Is Coming! Fun / Heads Up! Bang Out a Sweater Is Coming! We know it’s the week of Thanksgiving. We’re frankly worrying about whether the oven is going to work. But we are feeling extremely cool about something coming up that we want to tell you about now. Bang Out a Sweater happens during the month of February. If you have never Banged Out a Sweater with us, well, you’re in for a treat. It’s pretty much the most exhilarating, pedal-to-the-metal knitalong. The premise is simple: during the shortest month of the year, we all knit a sweater, start to finish. In recent years, we Banged Out a Stopover. We Banged Out a Hadley. We Banged Out a Carbeth. This year, we are going to Bang Out a Revolution. The designs that Norah Gaughan created for the new MDK Field Guide No. 9: Revolution are uniquely delicious as potential sweaters to Bang Out. The yokes and garment silhouettes are all interchangeable—if you like a certain cable pattern and a certain garment style, well guess what: these patterns make that very simple to do. The sweater shapes are versatile and flattering. Cardigan or pullover? Short sleeves or long? It’s up to you. When you consider the additional designs in Norah’s new collection, Interchange (ability), you’ll have even more options for yokes and sweater shapes. Kay is sort of obsessed with the ladybug yoke in Interchange (ability). Ann is changing her mind every day or two about which cable pattern will make her life complete. Scheming up a sweater can be one of the most diverting parts of knitting. Choosing a design and yarn? Intoxicating! Please put Bang Out a Sweater in your thinkerator and let it marinate and grow and be something really fun to think about during the coming weeks. We’ll be talking more about these designs. We’re really excited. 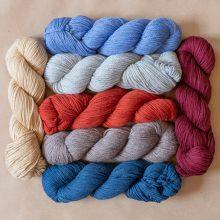 There are special yarns in the Shop for the designs in Norah’s Interchange (ability) and Field Guide No. 9. If you’re eyeing one of these, we encourage you to put it on your holiday wish list, or do what we do and just order it up. 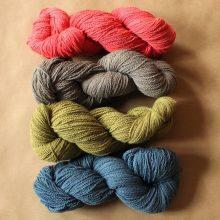 We’re getting better at anticipating interest in our yarns, but we’re still surprised when yarns disappear quickly. And our yarn makers need time to replenish our stock, because (dramatic voice) they dye their yarns by hand which is why they are so beautiful. It’s not too soon to share your strategies, schemes, ideas, and questions about what you’ll be Banging Out. 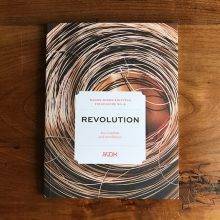 We’ve got a new topic in the Lounge, Bang Out a Revolution, and the Instagram hashtag #BangOutARevolution is ready and waiting for you to share your process. Just click on a pattern and it will tell you the yardage. The answer to that question is not a straight yes or no! These sweaters require the basic skills of in-the-round sweater construction (nothing too hard there, but you need to be able to follow a pattern). Plus: they have cables. So, they aren’t typical candidates for a first or second knitting project. At the same time, Ann and I have always believed that a motivated beginner can do almost anything in knitting. We made some amazing things when we were beginners, and just didn’t know they were hard. I will say this: these patterns are solid and straightforward, and anyone would be lucky to knit their first cable sweater from a Norah Gaughan pattern. 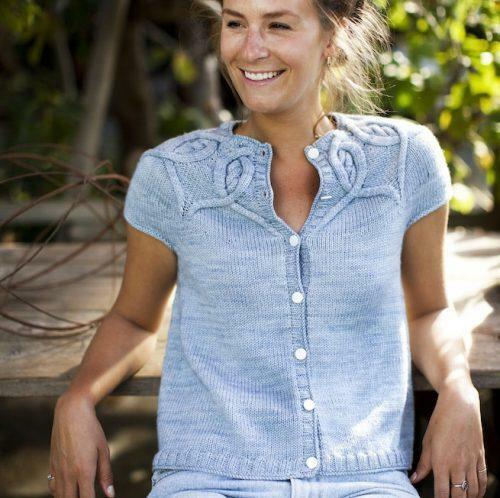 She writes a great pattern, and the knitter is in good hands. We will be supporting this knitalong with all our might, so everyone will have company working out any challenges. That’s the fun of a knitalong. It will be fun to follow along, even if you don’t make a sweater this time. I am totally going to Bang Out a Revolution! Can I swatch before February? I’ve never knit a yoke sweater before (or even a sweater in the round) so I am excited and nervous!!! I am going to make this happen! Wow that’s fantastic! As for swatching, our opinion is that swatching is not the same thing as banging—so go for it! I’m intrigued by the cables and love how the circular yokes look on the models but from sad experience I know that will not be true for me. Has anyone invented a trick for yoke-to-drop or yoke-to-set-in-shoulder conversion? I have not seen that but I hope it exists! I can and have banged out a sweater in a month before. But not cables. We are not friends. And I’m ok with that. So. Off to spin for my next non-cabled sweater. Wheee! I’ve not done a sweater before, but would love to give it a shot! I am really drawn to the rope & braid design in Interchage (ability). 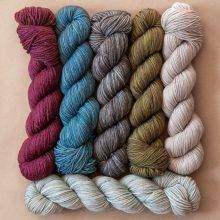 Could you tell me which of these beautiful yarns are recommended for this particular pattern? I would love to get it ordered before the color choices are limited. Thank you! 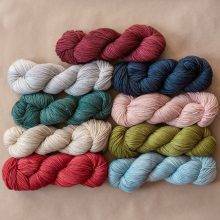 All the yarns will knit to the specified gauge of these sweaters, so it’s the knitter’s choice of whether to go a bit lighter or heavier, which color, etc. AHHHHH! So exciting! By Feb, the winter doldrums will be in full swing where I live, and I need something fun to think about for that time! now… how to pick which sweater? which yoke?? How fun is this!!! Yes, I’m in!!! Question: I don’t know how the pattern reads, but can you make the the sleeve on the cardigan longer? Just curious. That’s my favorite so far. I finally have my knitting mojo back with Field Guide 8 and a toddler, so I am so ready to Bang out a Revolution! Hooray! Bang out a sweater is the best KAL there is! You’ve been busy Banging Out a Human! Love the Bang Out event. I think I’ll be along just for the vibes and fumes this time-banging out a kit that has been marinating for awhile. Last year I managed the Carbeth from stash plus one skein. I’m upping my game this year! But where did that header picture come from? Are those Beatles fans waiting at the airport to catch a glimpse of the Fab Four? I follow you because you have amazing patterns. I’m not in to knitting yet but I do crochet. I just had to tell you that the pic you used for this post is awesome!! Hilarious! Made me want to click the post! We will get you into knitting one of these days. Resistance is futile! 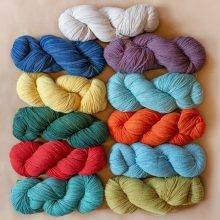 I can’t wait to “Bang Out “ a sweater or pick-up my copy of MDK #9 from my LYS. The other night as I was sitting in bed, knitting, and watching something wonderful on Netflix ( no advertising), it dawned on me that I was really happy ! Oh and I forgot to add the snoring Westie next to me. I am totally in love with the calligraphy cables. Thanks for the heads up as I need time to ponder whether it will be a pullover or cardi, add longer sleeves or not. So many decisions even before yarn choice…. I have never done Bang Out a Sweater before, but I definitely want to try it! I think the pattern and yarn will be this year’s Christmas present. I was just wondering over the weekend, as I looked through the new Field Guide, what we were going to bang out this winter! I love Rope&Braid, but I know I can’t get it done in a month. Although – I’m pretty sure Stopover is the only one I actually finished on time anyway…. I always think of March 15 as February 43rd. I’m currently banging out a Hadley. A little late for all the banging fun but I’m still amused. Tee hee! I’m also banging out a Hadley and still will be in February at this rate. So maybe not so much banging! Ooh…..I wish I were skilled enough to make a sweater. Even when I google the world’s easiest sweater’, they all look too hard for me. So, to those ladies and laddies who are partaking, I wish you well. Ladybug IS very intriguing! Then I looked at the ladybug’s spots and thought, “Can you combine cables and colorwork?” A quick Ravelry search shows that it is probably unlikely. However, how cute would it be as a child’s sweater in red, with small black buttons inside the spots? About a year ago I knit my first cabled colorwork item— a scarf for my husband— from a pattern by Stephannie Tallent (sunsetcat on Ravelry). She has a number of cabled-colorwork combos, and they are gorgeous— so yes, you can totally do it. Andi Smith has a bunch as well. I bet you could do it with one of these gorgeous Norah creations if you were an intermediate knitter who had done each technique before. In my experience, I just had to be REEEEEALLLLLY careful about moving the appropriate yarn to the back or front before cabling, but I got the hang of it pretty quickly. Hope that helps!!! Oh yeah. I’ve been marinating on doing one of these after my parallelogram scarf. I think I’m in for the cable from my he short sleeved pullover but maybe with long sleeves, or maybe not! Ladybug with lichen and lace worsted In the pressed flowers colour way – what do you think? I wish it was February! I decided to knit Calligraphy (at least now), ordered Lyonesse from Blacker Yarns. It arrived today and I am SO excited. I swatched and it was perfect. Now to wrap it back up, put in my MDK Peace Out bag and wait. Patiently. And finish the 15 projects I probably have started! The pattern(s) will be on your site as opposed to Ravelry?